6. Resolution to set the withholding percentage FYE 6/30/19 from OMV at 0.2%. The Louisiana Uniform Local Sales Tax Board held a special meeting at the LA Sheriff’s Association Offices, 1175 Nicholson Dr., Baton Rouge, LA 70802, on Friday, June 29, 2018 at 1:30pm. The following board members were in attendance: Donna Andries, Greg Ruppert, Amber Hymel, Tiffani Delapasse, John Gallagher and Mark West (Proxy for Roland Dartez), Amanda Granier (Proxy for Scott Richard). Absent: Mike Ranatza. • Motion by Tiffani Delapasse, seconded by Greg Ruppert to approve the Board minutes of the June 14, 2018 Regular Board meeting. Item unanimously passed.  Mr. Bergeron, Mr. Ruppert and Mr. West created a strategic plan to present for the June 30, 2017 deadline that represents the intentions and goals of the Board. The document was explained to and reviewed in detail by the Board before being accepted for filing. A copy of the plan can be viewed at the Board Office of Record in Jennings, LA.  Mr. Bergeron presented the details of the contract for the position of Tax Analyst currently being filled by JA Cline. The Board Attorney reviewed the contract and adjusted the language to protect the Board if events so arise.  A motion was made by Amanda Granier and seconded by Tiffani Delapasse to adopt the strategic plan today June 29, 2018 and becoming effective July 1, 2018. The item was passed unanimously by the Board.  A motion was made by Tiffani Delapasse and seconded by Greg Ruppert to approve the contract for the Tax Research Analyst. The item was passed unanimously.  Motion made by Amanda Granier and seconded by Tiffani Delapasse to adopt, sign and present a resolution to the OMV directing to set the withholding percentage FYE 6/30/19 for monies related to the Board funding to 0.2%. o The OMV had the withholding percent set to increase to 0.25%, however, the Board has been able to budget their operations to maintain the rate as it currently stands. o The item passed unanimously and the resolution was subsequently signed by the Chairperson.  Motion by Greg Ruppert, seconded by Tiffani Delapasse to adopt the Treasury Services Authorization to designate the chairperson, vice-chairperson and executive director to act on behalf of the Board to contract and transact with respect to all matters with Hancock Whitney Bank. Item passed unanimously.  Motion by Amber Hymel, seconded by Amanda Granier to authorize the Executive Director to attend the SEATA Conference in Nashville, TN on July 15-17 2018.
o Mr. Bergeron will obtain business cards identifying himself as the Executive Director for the LULST Board to distribute at the conference. He will also provide a report to the Board detailing the Conference activities and interactions as they relate to the Board operations and Local Collector activities. o Item was unanimously passed by the Board.  Motion by Greg Ruppert, seconded by Amanda Granier to adopt a rule prohibiting the introduction and subsequent voting on an agenda item within the same meeting. o This rule would allow the Board to review in detail any rules, budgets, items so there is time to question and become educated on the subject before making a final decision. o This would also benefit those members who send a proxy in their place, that they can be informed of Board items before a final vote is made. o Item unanimously passed by the Board. • Greg Ruppert motioned to go into Executive Session to discuss current litigation. No public comment was given and the item was added to the agenda as the result of a unanimous roll call vote. 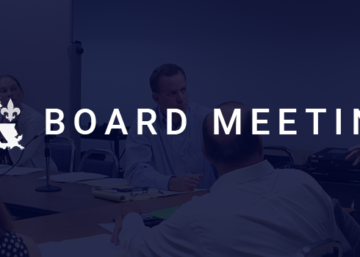  The Board exited Executive Session at 2:48pm by way of a motion to exit by Amanda Granier, which was seconded by John Gallagher and unanimously approved by the Board. • The Board discussed the impact of the SCOTUS Decision on South Dakota vs. Wayfair. o The Board will take the initiative to poll the local collectors and start creating a uniform tax matrix. Then the next step would be to determine what jurisdiction lines are and develop a system that correctly recognizes these lines along with rates. • The Board moved the next regular meeting from July 12, 2018 to Wednesday, July 11, 2018 in order to coincide with the Remote Seller’s Commission Meeting which is also on July 11, 2018. Motion to adjourn at 3:33pm was made by Amanda Granier and seconded by Amber Hymel and unanimously passed by board.